Back in March, when my husband and I had agreed to include the Inca Trail as part of our activities when visiting Peru with our boys I researched the various tour companies who operate this tour. I’d decided upon Q’ente Tours because their small-group option (max 8 people) wasn’t as expensive as a private group, yet gave us the option of a small group on whom to inflict our children. As it turned out, the group was just us, a guide and porters. I’m not sure our guide, Alex, has ever spent so much time playing Charades or Twenty Questions, or talking about superheroes and kid’s TV shows as he did while guiding us on this famous trail. That he did so with good humor while concurrently managing to keep all of us in line and teach us about the Incan sites we visited and the flora and fauna on the trail is testament both to his expertise as a guide and Q’ente’s high standards. We zipped along the trail on Day 1 reaching our campsite by mid-afternoon well ahead of the porters (with tents and food). At Alex’s suggestion, we decided to continue on for about an hour, starting the forbidding climb up towards Dead Woman’s Pass. Sitting at the campsite, our hiking on that first day over, watching our kids help porters from another team help put up tents, I felt that this trek might not be as bad as we’d feared after all. At 7am the next morning my smugness had evaporated into the clouds around us. We were within sight of the top of the highest pass on the trail and BigB was in tears. We’d started around 5am, making great time up the steep path, the steps at times as high as BigB’s hips. But now his legs were tired and his spirit too low even to admire the vista of tall mountain peaks and steep valleys around us as we sat to rest before cresting the pass. I took his hand and we walked on together, each step taking us closer to the goal. After a round of photos at the top, he joined his brother racing downhill – with Alex cautioning in both of them to take it easy. When I caught up, Brendan exclaimed that his “energy and happiness reserves” were full again. I told him I’d suspected as much – the fact that himself and his brother were singing at the tops of the voices was an obvious hint. We hiked for less than three hours on Day 3, down, down, down. Down stairs carved into the mountainside and through “tunnels” where the trail went under massive boulders that couldn’t be moved. We rested at Phuyupatamarca, admiring the view of the river valley below. The tents at the final campsite, Wiñay Wayna were visible through the trees below us. At this point, interest in Inca sites was flagging among the Murphy boys so we high-tailed it for the campsite. I have to admit I was a willing conspirator, craving the hot shower that I knew I’d be able to have there. In the afternoon, we visited the Wiñay Wayna site itself and even the boys admitted that it was worth it (or maybe they were just happy that they’d had soda and a candy bar on reaching the campsite). 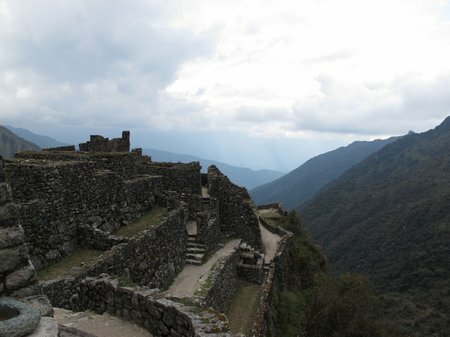 Built into the side of a valley, this semi-circular site is considered by some to be more beautiful than Machu Picchu. The dramatic setting, on a steep valley, surrounded by towering peaks, is breath-taking in itself. We turned in early since we had to be up at 3am so that our porters could pack up our campsite and leave in time for their train back to Ollantaytambo. Check back to read about the final (very short) hike to the Sun Gate at Machu Picchu and our visit to the amazing place. – There’s a great map at AndeanTravelWeb.com (a great resource for travel planning in this area). – We hiked for about 4.5 hours on day 1, 5 hours on day 2 and 3 hours on day 3. – On day 1 and 2, we hiked for about 2 hours in the morning (with snack stops), broke for lunch for about an hour and then continued on in the afternoon. – We ate like kings on the whole hike. Juan, the cook, performed culinary miracles in a tiny tent with a 2-ring cook-top. Information on traveling to Peru with Children. 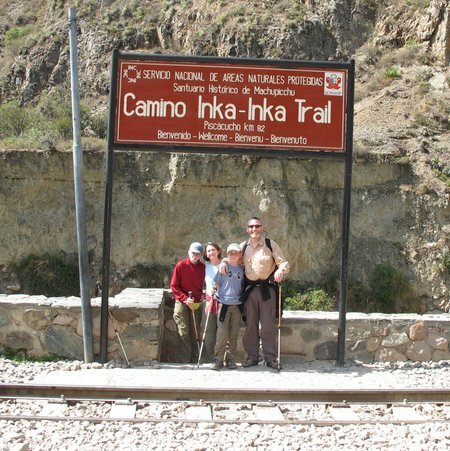 This entry was posted in International Escapades, Peru and tagged Inca Trail, Machu Picchu, Peru on October 31, 2010 by wandermom. This is amazing Michelle. Truly a dream of mine. I love the way you talk about taking your son’s hand and reaching the goal together. I’m a little jealous, a lot in awe, and totally missing you right now! Any guidance on taking a 3 and a half year old? Hi! We’re pondering such a trip for next year with our three boys (ages 12, 10 and 5). We were thinking of splitting up and having one adult hiking with the two older boys while the other hangs out in Cusco for a couple of extra days and goes up by train. Do you think that would be doable? How old were your kids when you did this? OUrs will be 10 and 12 and are good hikers/skiers, so we’re thinking no problem. What do you think? I an thinking about ring with my family and was surprised to see how short the hiking time was. many tours advertise 6-7 hours per day. did you request shorter days? 2. We had a small group – just us actually. I paid extra for a small group because I thought it might be difficult to have kids with a large group of 20-somethings. As it turned out, we would probably have been fine with a larger group but the small group meant we moved at our own pace and didn’t have to wait for stragglers. Our boys were 10 + 14 + likewise, good hikers + skiers.